The Steep Approach to Garbadale is the third novel I’ve read by Iain Banks, and my favourite so far of his books. I started with The Quarry a few years ago and nearly gave it up because I couldn’t get interested in the story, but by the end of the book I had been well and truly caught. Next for me came Espedair Street, the tragic-comic story of a one time rock-god. The Steep Approach to Garbadale is the story of the Wopuld family, whose ancestor created an enormously successful game called Empire!, which is known as Liberty! in the USA. At the time the story takes place, the family run the business which has made them all rich, and are considering an American company’s offer to buy them out. The main character is Alban McGill, who had worked in the family business before leaving, disillusioned, after the rest of the family voted to sell 25 percent of the company to the Spraint Corporation some years ago. Since leaving the family business, Alban had sold all but a token amount of his shares, and worked as a forester. Alban lives in a group house with friends whose low socio-economic status provide an interesting contract to Alban’s family’s fabulous wealth. Alban is a man whose past has deeply affected his present. He is a good bloke, caring and kind, with good morals and values, but he cannot commit to his girlfriend, who doesn’t actually want much from him. Alban’s commitment issues are caused by his mother suiciding when he was a baby, and a teenage romance he had with his cousin Sophie which he never got over. It doesn’t help that the Wopuld family act more like business partners than as a family. An example of this is Alban calling his grandmother, who is a controlling witch, by her first name, Win. (The connotations of his grandmother’s name are a clue to her character). The present day story begins with Alban’s cousin, Fielding, tracking Alban down to ask his help to convince other family members not to sell their shares to the Spraint Corporation, in order that the business can remain a family business. Alban agrees to help Fielding and they start to do the rounds of the family. There are dotty Great-Aunts, black sheep and cousins, aunts and uncles galore. The story moves around in time, telling of Alban’s childhood, the ill-fated romance with his cousin, travels around the world as a young man, and of his time working for the family business. Why did Alban’s mother suicide? Why was Alban’s grandmother so cruel? Why did I want Alban to end up with his cousin Sophie, when his girlfriend was so right for him? Would the family sell Empire! to the Spraint Corporation? I got the feeling that Iain Banks used his characters in this novel as a mouthpiece for various issues he feels strongly about, for example, the War on Terror got a caning as did American capitalism, which Alban likens in a speech to his family to Imperialism. The approach to religion was interesting too, as Alban recognises his love for Sophie has similarities to a cult religion. By the conclusion of The Steep Approach to Garbadale, I felt deeply satisfied with the way the stories and questions were resolved. The only things left to say are, I wish Empire! was a real game, and I’m looking forward to reading another Iain Banks novel. Espedair Street is the second Iain Banks’ book I’ve read in the past year. My new plan is to save the books of his which I haven’t read for when I am in a reading rut, because after reading Espedair Street and The Quarry, I feel as if I can rely on his stories to be entertaining. The story of Espedair Street is told by Daniel Weir, a lonely man in his early thirties who used to be in one of the biggest rock bands in the world. Despite being a musical genius with fans from all over the world, Daniel has terribly low self confidence and is not a happy man. In the beginning of the book Daniel is contemplating suicide. He hides his true identity from his only friends and has regular bookings with a prostitute, to prevent him getting too attached to his own attentions, (for want of a better expression). Before becoming famous as part of Frozen Gold, Daniel was a nerdy teenager from a very poor Catholic family in Glasgow. He very often comments during the telling of this story how physically ugly he is, but before the band became successful Daniel had a girlfriend, who seemingly loved him regardless. Being a teenage boy on the verge of stardom though, Daniel left his girlfriend behind to live the life of a rock star, flying around the world to play tours, partying and enjoying romances with other members of the band. I actually felt sorry for Daniel, which doesn’t seem all that crazy when you consider the lives of celebrities these days. I don’t think there is enough money in the world to make up for not being able to do what you like when you like without being photographed or harassed or taken notice of, but as a young man Daniel loved his life with the band. He and the other band members were a family of sorts and had their adventures together. Drugs and alcohol were a major part of all of their lives and should have been their downfall, but somehow it was their more considered choices which harmed them, rather than the insane things they did when they were smashed. Daniel’s depression is due to his feelings of guilt because of tragedies affecting his fellow band mates. Rightly or wrongly, Daniel feels responsible for the choices other band members made. Even though Daniel is a melancholy character who has experienced some really hard times, the comedy in this book is really funny. Daniel and his mate get a dog drunk, (hear me out, I’m not condoning getting animals drunk – I don’t drink alcohol myself and don’t forget, this didn’t really happen – it’s a made up story), but the story of the poor dog getting drunk after going on a pub crawl with Daniel and his mate is hilarious. The dog was actually owned by Daniel’s mate’s uncle, who gave the dog money to pay for a round when it was the dog’s turn to shout. The story of Daniel and his mate getting in a fight which trashed a nightclub is hilarious too. Now I come to think of it, a great many of the funny stories in this book happened when Daniel or other band members were either drunk or on drugs…hmmm, maybe I’m missing out on something as a teetotaller… Nope, not really. The things that could have gone wrong with Daniel and his fellow band members but didn’t, made great stories, but they could just as easily have ended tragically. Despite all of the crazy things Daniel and the other characters did when they were drinking or drugging, (if that isn’t a word it should be), these were only things that happened along the way of the actual story. The story shifts back and forwards between the present, which is Glasgow sometime in the 1970’s, and Daniel’s recollections of the past with the band. There are a lot of layers to this story. 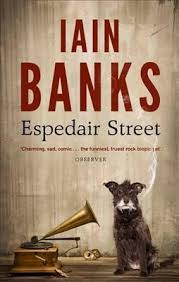 Espedair Street was a very enjoyable second Iain Banks book and I am already looking forward to my third. I nearly stopped reading The Quarry by Iain Banks after a few chapters because I couldn’t get into the story. I’m not sure why I persevered, but after only a couple more chapters my opinion had reversed, feeling grateful I hadn’t put this book aside. The Quarry tells the story of a single weekend, from the point of view of Kit, an eighteen year old English boy. Kit is autistic, a socially inept genius, whose father, Guy, is dying of cancer. On the weekend of the story, a group of Guy’s old friends come to stay. The weekend is a chance for Guy and his friends to remember the glory days of their friendship, when they shared a house while in university. During this time they made films together, but Hol is the only one still working in the film industry, as a critic. Paul became a lawyer, Rob and Ali are in business, Pris is a needy, single mother and Haze is a drop out and drug addict. Guy’s friends also have an ulterior motive for visiting, which is to find a particular movie they made together, which has the potential to embarrass or even harm their careers and family lives if it were to become public. As I said earlier, the characters and story grew on me the more I read. Kit is a likeable character and I could come around to his way of thinking, which is slightly different to the norm. For example, I’ve never thought of my age metrically before, but Kit’s way is such a satisfying way to measure age and time, (for the record, I’m 4.5 decades old). All of the characters drink too much, use drugs and do stupid things. Their behaviour is selfish, mean and cruel. They are also generous, loving, funny and interesting. Guy is the most interesting character. He is angry about dying, and rants and raves and says terrible, unkind things to Kit, who he is dependent on. Guy’s behaviour is understandable, but I hated him for his behaviour towards Kit. More than anything, I wanted Guy to tell Kit the truth about who his mother was, something Kit should know. Instead of telling Kit the truth, Guy suggests that Hol or Ali or Pris might be Kit’s mother. The story is full of clever and funny observations and situations. Hol made a comment about girls being swept off their feet and ending up on the backs, which left me snickering. This may seem obvious, but the idea was new to me, and funny because it is true. Hol also tells Kit that just because you can trust a person with your life, that doesn’t mean you can trust them with your money, rang true also. The Quarry had a happy-sad ending, which was probably inevitable, although the story is quite satisfying in that all of the loose ends are tidied up. I haven’t read any other books by Iain Banks before, but will actively look for others.